We’d love your help. Let us know what’s wrong with this preview of Rebel Talent by Francesca Gino. Do you want to follow a script -- or write your own story? Francesca Gino, a behavioral scientist and professor at Harvard Business School, has spent more than a decade studying rebels at organizations around the world, from high-end boutiques in Italy's fashion capital, to the World's Best Restaurant, to a thriving fast food chain, to an award-winning computer animation studio. In her work, she has identified leaders and employees who exemplify "rebel talent," and whose examples we can all learn to embrace. Gino argues that the future belongs to the rebel -- and that there's a rebel in each of us. We live in turbulent times, when competition is fierce, reputations are easily tarnished on social media, and the world is more divided than ever before. In this cutthroat environment, cultivating rebel talent is what allows businesses to evolve and to prosper. And rebellion has an added benefit beyond the workplace: it leads to a more vital, engaged, and fulfilling life. 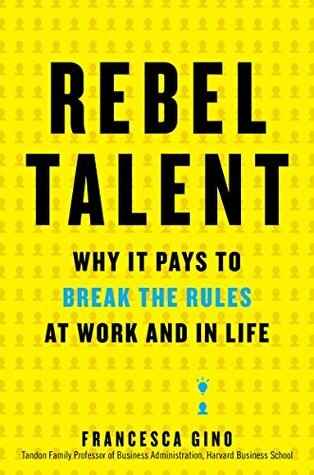 Whether you want to inspire others to action, build a business, or build more meaningful relationships, Rebel Talent will show you how to succeed -- by breaking all the rules. To ask other readers questions about Rebel Talent, please sign up. The only good thing about this book is the title and the concept. Everything else wasnt as I expected. THe book was filled with stories to the extent you just lose hold of what the writer is trying to tell you. There were also instances where the stories had nothing to do with Rebel Talent but was included for purposes only known to the author. A lot of really interesting insights into how to have a more successful workplace and be a better "rebel" employee. Unfortunately I will probably never be really good at most of these, but I might be more willing to tolerate and even applaud these things in others even if it makes me uncomfortable, which is apparently a better way to be anyway. This was an interesting read. For a non-fiction book it had some good real life examples and studies of leaders in the workforce. However, I would have liked if there was more of an outline on how to take the steps to become a rebel leader. It was actually a quick read and I gained a couple insights. Simply because my conscience won't allow me to mark this book as complete without some sort of disclaimer: I didn't actually finish this book. Our work club unanimously decided to stop reading/discussing the book at Chapter 6. I was pretty disappointed with this book. The Introduction seemed to be the most informative part of the book, setting the five guidelines for rebel behavior. The rest of the book morphed into story after story of so-called "rebel talent" that left quite a bit to be desire Simply because my conscience won't allow me to mark this book as complete without some sort of disclaimer: I didn't actually finish this book. Our work club unanimously decided to stop reading/discussing the book at Chapter 6. This book claims to present a discussion on 'rebel' individuals in the workplace. Having worked in numerous companies (both start ups and multi-nationals) it is clear that people with different ideas are important, but this book lacked any real depth, it mentioned people / companies but in (what felt like) a superficial way. An in-depth study of a single organisation may have worked better. It read like a newspaper article stretched out to fill a book. Gino teaches MBA at Harvard Business School. Rebel talents are leader who do things the non-traditional way. Gino is Italian so she is fascinated by Chef Bottura who dropped out of law school to start a Michelin-star restaurant. He has inspiring books in a library for his staff to read and he invites speakers to talk to his staff and make dishes out of the topics shared. She also introduced other leaders in Pixar and Campbell, who have decidedly unorthodox ways to manage their staff. Staff are e Gino teaches MBA at Harvard Business School. Rebel talents are leader who do things the non-traditional way. Gino is Italian so she is fascinated by Chef Bottura who dropped out of law school to start a Michelin-star restaurant. He has inspiring books in a library for his staff to read and he invites speakers to talk to his staff and make dishes out of the topics shared. She also introduced other leaders in Pixar and Campbell, who have decidedly unorthodox ways to manage their staff. Staff are encouraged to disagree, to spar with each other. Francesca Gino is an award-winning researcher and teacher, and a tenured professor at Harvard Business School. This Is A Book Required To read And Develop Self Confidence And Energy In Ourselves. Author Present Book in a Most Effective Way and Try To explain How We Rebel In Such A Way To Get Success In Our Professional Lives. Book covers Various Examples of Peoples Who Adopt A Rebel Way To Achieve Something Different In Their Lives , I Think The Experience of Author And Understanding The Behaviors of Peoples , Author Present The Topic In A Most Interesting Way. As Rebel Is A Negative Word But If You Adopt In Such A Way explain In The Book That Automatically Convert into Positive Way. All The Lessons In The Book Present In Most Effective Way As The Readers Read And Understand How Rebel Talent Is Actually Gives Us. The Book Covers Real Life Experiences And Case Studies of Various Peoples Through Which Readers read And Take Inspiration To Develop Same Skills And Motivation To Do Something Different In Their Professional fields. So Read And Enjoy The Book And Get Positive Moral Booster. I enjoyed reading REBEL TALENT and read it cover to cover. I highly recommend this book. The book starts strong, with an interesting story about a small Italian restaurant in a small city of Modena, recently named the number one restaurant at The World’s 50 Best Restaurants Awards. The chef and owner is a unique, very positive character, and his approach to food and life is quite special. But somewhere along the way, the book dilutes into a collection of seemingly unrelated short stories, out of which the author tries to distill strategies to encourage creative thinking within the reader and whomever they will be working with. Many of these stories have already been told many times before, while others seemed to only be superficially touched upon, just so that a convenient conclusion could be made. Gino pulls together many anecdotes, studies and experience to build up a picture of what constitutes rebel talent and rebel leadership. The main premise unfolds slowly; it takes patience to work through all the stories and discussion to get to the point. I enjoyed the stories and did get some good food for thought. The Pygmalion Effect and a "CV of failures": these are my big takeaways from this book. Rebel Talent started off a bit slow for me: too much of the author establishing her own connection to the concept. However, it picked up the pace quickly enough to become a great read with lots of nuggets of wisdom for all. The section on the Pygmalion effect had the most direct influence on me. (p126.) The Pygmalion effect is where "a person's expectations of another person turn into a self-fulfilling prophec The Pygmalion Effect and a "CV of failures": these are my big takeaways from this book. The section on the Pygmalion effect had the most direct influence on me. (p126.) The Pygmalion effect is where "a person's expectations of another person turn into a self-fulfilling prophecy." I have experienced this in my own life, as a student invited to be part of a school enrichment program, where all students were deemed "creative" and "gifted". This labeling led us to believe it, even if it may not have been true! I call it positive brainwashing. In a sense, we aimed to fulfill this prophecy, and if it truly were social experiment, which I sometimes think it might have been, we truly did rebel against low expectations, and embrace high expectations. I also loved the idea of a CV of failures. I think this concept brings authenticity to humans. I will definitely adopt this idea in my own life, and probably embed it in job interviews somehow as well. As a side note: I always find it interesting that books whose audience is the Executive MBA are written in short chunks to make it quickly digestible. The perception that the person is consciously choosing not to conform is critical. Princeton university professor Johannes Haushofer became a folk hero of failure. In his "CV of failures" he listed the many positions and awards for which he applied and had been rejected. He said "Most of what I try fails, but these failures are often invisible, whereas the successes are visible. I have noticed that this sometimes gives others the impression that most things work out for me." 146-147. Relevant and applicable to so many areas of my life! The anecdotes were powerful. 3. Open conversations, Don't close them: "yes and..." from improv or "what COULD we do?" vs. "what SHOULD we do?" 4. Reveal yourself and Reflect: From Hamilton - "Talk less, listen more"
5. Learn everything - then forget everything - return to the fundamentals. Equal parts scholarly research, professional case studies and personal stories, this book adeptly addresses the reasons to rebel in the workplace (and to promote a non-conformist culture). Some good stories in this book, so I'm glad I read it. And I'm a fan of the central idea that rebellious attitudes towards work create greater value than traditional, hierarchical, and non-creative approaches. But I thought the book lacked focus, splashing around in the shallows of unrelated topics and failing to connect them well enough. Overall, I enjoyed the book Rebel Talent. I read this book as part of my company book club and thought it had some really great nuggets to grab on to. I also thought it gave a lot of helpful tips to organizations. Great choice for a work book club. Loved the information about shoppers and how they were perceived. I think it is always fun to see ideas brought together with numbers. In high-end boutiques wearing sweatpants signaled to workers that you didn't need to impress. The info Overall, I enjoyed the book Rebel Talent. I read this book as part of my company book club and thought it had some really great nuggets to grab on to. I also thought it gave a lot of helpful tips to organizations. The information about confidence boosting from non-conforming. It breeds creativity and confidence. "comfort is overrated. It doesn't make us as happy as we think it will." Rebels never stop asking why- Millenials do this often. "Organizations that women lead tend to have better financial performance." Female participation in the labor force accelerates economic growth. I thought it was great that there was a good amount of information about how getting women in leadership positions is important. Unfortunately, this is still not the norm therefore still needs to be talked about. Some of it truly is about rebels, but most of it is about being thoughtful and a lifelong learner, and the author has just shoe-horned really awesome but less glamorous examples into the category of stories about "rebels." I don't think anyone else would say that Sully was showing rebel talent when he landed in the Hudson and saved all of those lives. Courage, experience, and brilliance, yes, rebel talent, probably not. And a lot of it is just nicely summarized organizational behavioral research Some of it truly is about rebels, but most of it is about being thoughtful and a lifelong learner, and the author has just shoe-horned really awesome but less glamorous examples into the category of stories about "rebels." I don't think anyone else would say that Sully was showing rebel talent when he landed in the Hudson and saved all of those lives. Courage, experience, and brilliance, yes, rebel talent, probably not. And a lot of it is just nicely summarized organizational behavioral research, but it's not particularly rebel-oriented. There are many ways to rebel, such as putting ex lax in the church brownies. To the 10 year old boy on the back of the Ducati motorcycle, I salute the rebel in you. This part of the book made me laugh! This looks at how you can become a pink sheep and break the mould and be who you want to me. Rather than follow the crowd and be a white sheep, be your own person and stand out. The book is mainly focused on Rebel Talents and organisations, but Francesca is a good writer, making research readable and promoting rebelism. As do I. So yeah, I loved this book. The Author, Francesca Gino, provides some very actionable recommendations on how to be more authentic in the workplace and how that can positively impact your career. She calls this being a rebel, because it's not allowing the status quo to continue when it forces people to be inauthentic and dramatically decreases the engagement of employees at companies. This boo I was requested to review this book, because the author found my review of Creativity, Inc. After reading this book, I understood why. This book spoke to me on a number of levels. First was, of course, the relationship with Creativity Inc. Gino interviews the team at Pixar and draws a number of lessons from the organization, which has a long history of success. Some of the best things she calls out actually come from even older organizations, like Bell Labs (long corridors to find the restroom encouraging people bumping into each other) and Xerox where Jobs learned his love of the computing. The other reason I'm a big fan of this section is that Pixar uses a number of Lean tools in their organization, which I believe are highly subversive and drives a lot of the behavior that Gino argues is Rebel talent. In this section she doesn't specifically call out Lean as a methodology that Pixar uses, which is fine. The result and the tools that the team uses are what matters not the specific methodology. Of course, there's a large section on the Chef of Osteria Francescana, Massimo Bottura. This guys is pretty awesome and connects with his staff on a personal level. If you've seen Chef's Table, then you've seen an episode about him. He's humble, always trying new things, always learning, and always in the trenches with his staff. These make him an outstanding leader. There’s a certain paradox in the title of this book. Rebel Talent is, until reading, bound to conjure up different images for different people. Personally, I was expecting something along the lines of managing outliers, talented mavericks, people weighted with personal-baggage etc. What I found however, was an excellent portrait, painted in a clear and engaging narrative, that espouses virtues such as empathy, resilience and authenticity. Francesca Gino uses her own collected stories, academic f There’s a certain paradox in the title of this book. Rebel Talent is, until reading, bound to conjure up different images for different people. Personally, I was expecting something along the lines of managing outliers, talented mavericks, people weighted with personal-baggage etc. What I found however, was an excellent portrait, painted in a clear and engaging narrative, that espouses virtues such as empathy, resilience and authenticity. Francesca Gino uses her own collected stories, academic findings, psychological principles and interviews from sources as far afield as Osteria Francescana, a famous restaurant in northern Italy, to the BBC, Pixar and the Campbell Soup Company, to highlight leaders who led positive changes by adopting a ‘flat-organization mentality’ absent the hierarchical decision-making found in most companies. One great example of a story used to underscore the power of continuous learning, and, what Carol Dweck would describe as a Growth Mindset, comes from the story of Chesley Sullenberger, the pilot who miraculously landed US Airways plane on the Hudson River without losing any of the 155 people aboard after losing both engines over Manhattan. There can surely be few professionals who so brilliantly demonstrated the power of always pushing the envelop of learning than Sullenberger - and his feat of saving all those lives on that frigid January day during the all-news-was-bad-news days of 20009 will forever serve as a monument to his Rebel Talent. That Francesca Gino made his story even more compelling than his own book on the subject is a credit to her. Great book by Francesca Gino, professor at Harvard Business School. This is quite an enjoyable & fun book. It is well written and handpicks many stories, academic findings, psychological principals that exemplify how “rebellion” can be a positive force @ work and in life. We all have a rebel side within us. Many known leaders such as Steve Jobs, Connant Campbell, among others have leaded by unconventional ways (not always sticking to basic rules or plans). You will learn that experimenting an Great book by Francesca Gino, professor at Harvard Business School. This is quite an enjoyable & fun book. It is well written and handpicks many stories, academic findings, psychological principals that exemplify how “rebellion” can be a positive force @ work and in life. We all have a rebel side within us. Many known leaders such as Steve Jobs, Connant Campbell, among others have leaded by unconventional ways (not always sticking to basic rules or plans). You will learn that experimenting and applying new risky ideas can go long ways. The 5 talents that she states we see again and again, in rebels: Novelty, curiosity, perspective, diversity, and authentic. Gino’s research suggests that we can actually bring more joy into our lives by being rebels, by behaving in ways that defy conformity. Otherwise things tend to become old, boring and predictable. We need excitement, we need new experiences and new ways of thinking to keep things alive. Ask questions, ask for advice, keep exploring, keep open minded, acquire new skills, master new situations. Use “counterfactual thinking” to forget what you know and consider a situation from a new perspective. It takes the focus away from just our own view. Livro sobre comportamento humano e do individuo nas organizações. toma como tese, a importância de uma postura que designa por rebelde em que o indivíduo, de forma consciente, mas construtiva lidera e organiza as suas ações de um modo autónomo e colocando em causa o estabelecido, o que lhe permite melhores desenpenhos e novas perspetivas que podem beneficiar o próprio e as organizações em que se inserem. Possui cerca de 300 páginas e é uma leitura fluida com muitos casos de uso ou estórias que ilu Livro sobre comportamento humano e do individuo nas organizações. Possui cerca de 300 páginas e é uma leitura fluida com muitos casos de uso ou estórias que ilustram o ponte de vista da autora, com uma estória central de um dono de um restaurante de topo, recortada por muitas outras narrativas. Tem ritmo e torna a leitura fácil e alegre. O livro é bastante recente e constitui um testemunho atual da psicologia comportamental, no contexto das organizações. Из книги получилась бы неплохая статья для профильного журнала типа Ad Age, но расписав одну, не очень-то и новую, идею на целую книгу, у автора получилась очередная книга по бизнес-литературе, тип которых каждый год выпускается десятками. Они мало что после себя оставляют, их редко кто держит на книжной полке, читаются они точно также как журнальные статьи и никогда не содержан чего-то нового или хотя бы интересного. Даже если я не специализируюсь непосредственно на менеджменте, я всё равно не Из книги получилась бы неплохая статья для профильного журнала типа Ad Age, но расписав одну, не очень-то и новую, идею на целую книгу, у автора получилась очередная книга по бизнес-литературе, тип которых каждый год выпускается десятками. Они мало что после себя оставляют, их редко кто держит на книжной полке, читаются они точно также как журнальные статьи и никогда не содержан чего-то нового или хотя бы интересного. Даже если я не специализируюсь непосредственно на менеджменте, я всё равно не вижу причин, кому бы она могла пригодиться. Easily digestible, bite size pieces, of hand picked history placed throughout the book highlight the points made in Rebel Talent. Well written, thought out, and researched creating an easy to read, understand and quite enjoyable literary piece. Recommended to read with a pen and a pad of paper at the ready. Littered with thought after thought, coating your mind with small and big ideas alike that require a place to blossom. - Expectations can influence results- the placebo effect Easily digestible, bite size pieces, of hand picked history placed throughout the book highlight the points made in Rebel Talent. - Expectations can influence results- the placebo effect and how to use expectations to influence your own behavior to create better outcomes. - Conflict can lead to growth. - Why we must fight the urge to stereotype and why we do it to begin with. - How improv can have an impact on your work. - How experience can distort our responses and how to combat it while retaining our wisdom. Highly recommended for anyone who would like to improve their life from the inside out. Professor Gino marshals research showing that being a rebel and having a rebel mindset can be beneficial to teams and to the rebel themselves. The book is a quick read as Gino is a very good storyteller. The book is serious but not bogged down in the academic prose that similar researchers lose the reader in. She uses a couple of examples of the “Rebel Talent” as threads that hold the narrative together – a restaurateur in Italy, and the Pixar studios. Both are positive examples of what can come Professor Gino marshals research showing that being a rebel and having a rebel mindset can be beneficial to teams and to the rebel themselves. The book is a quick read as Gino is a very good storyteller. The book is serious but not bogged down in the academic prose that similar researchers lose the reader in. She uses a couple of examples of the “Rebel Talent” as threads that hold the narrative together – a restaurateur in Italy, and the Pixar studios. Both are positive examples of what can come of going against the grain. Overall, I enjoyed the book, but I wanted more of the other side – is there a way to empirically see people who have the rebel talent and set them going and see if it is more likely they’ll be like the Pixar people and less likely they’ll be like Bernie Madoff? I received a review copy in exchange for a review. Her consulting and speaking clients include Bacardi, Akamai, Disney, Goldman Sachs, Honeywell, Novartis, P&G, and the U.S. Air Force, Army, and Navy. She has been honored as one of the world’s Top 40 Business Professors under 40 and one of the world’s 50 most influential management th Francesca Gino is an award-winning researcher and teacher, and a tenured professor at Harvard Business School.